That’s right, it’s time to pull an all nighter people, Tiny Owl Knits party is tomorrow! I’ll be working on my little Bee-Keeper Cushion to the last minute even though I happen to know a few knitters will be attired in multiple items. Feel free to bring your WIP’s along, I might be joining you…. Kynna has finished her pretty legwarmers. 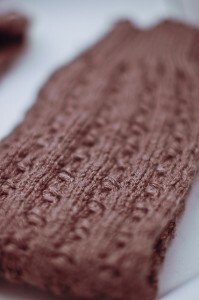 I thought for some reason she had knit them in the Berocco Ultra Alpaca but of course she knit them in the luxurious Pear Tree Yarns. 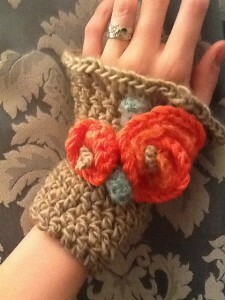 Amanda added to her beautiful Oh My Bear with a cute little pair of Rosie Wristlettes. She crocheted these in Rowan Cocoon, Debbie Bliss Angel and Sublime Baby Cashmere Merino Silk DK (along with a couple of odds and ends for the leaves). Party is tomorrow at 6:30 and there will be cookies and tea as usual! See you there! There is something so nice about a day of hearts. While it can get a little hallmark-ish I try to boil it down to the good intentions of the day: expressing your love to those who mean the most to you. Being a rather un-romantic individual I’ve never made to much of the day but I do like to make something nice for my hubby just to show I care. This year will be even less romantic for me, but I’m sure in love with my new baby, it certainly marks a different phase. If you are trying to find the perfect gift for that special someone, there is nothing more heartfelt than a handknit gift. While my hubby is wary of complimenting my knitted items, lest I knit him a complete outfit or something crazy like that, he really loves the cashmere toque I knit him a few years ago. It’s the only knitted thing he will wear but he wears it with pride! It’s a pretty dull knit, or it would be if is weren’t cashmere! I knit Devon’s Toque, the pattern that comes with every skein of Handmaiden Cashmere. If anything could turn someone into a knitting fan, it’s cashmere. Even men are susceptable to it’s powers. If you’re trying to win someone over with your knitting I recommend this project. If you are looking for a pretty hat for yourself, or a special lady in your life, check out Amanda’s latest pattern the Heart Hat. 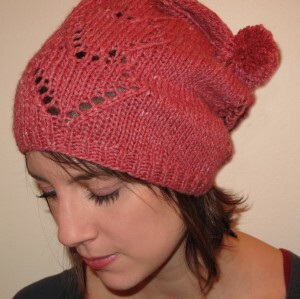 It’s got a little heart shaped lace and my personal fave: the pompom. It’s made in a fabulous yarn too, Pear Tree 10 ply. This yarn is unbelievably soft merino. I mean it, in a blind test I would have definitely guessed cashmere or perhaps alpaca, it is soooo soft. 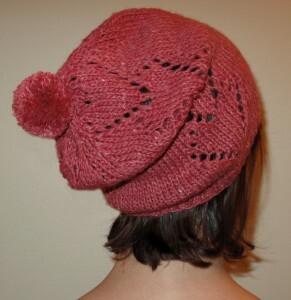 Slouch hat’s are all the rage, I’m thinking I might make mine in grey….